Jangan le ingat MacGillivray boleh releks saja masa ini. Dah le berhadapan dengan kegiatan PKM yang tidak melepaskan peluang membuat huru-hara, Tunku pula mendesak Inggeris mempercepatkan proses mengakhiri 'shooting war' supaya darurat boleh ditamatkan secepat mungkin. 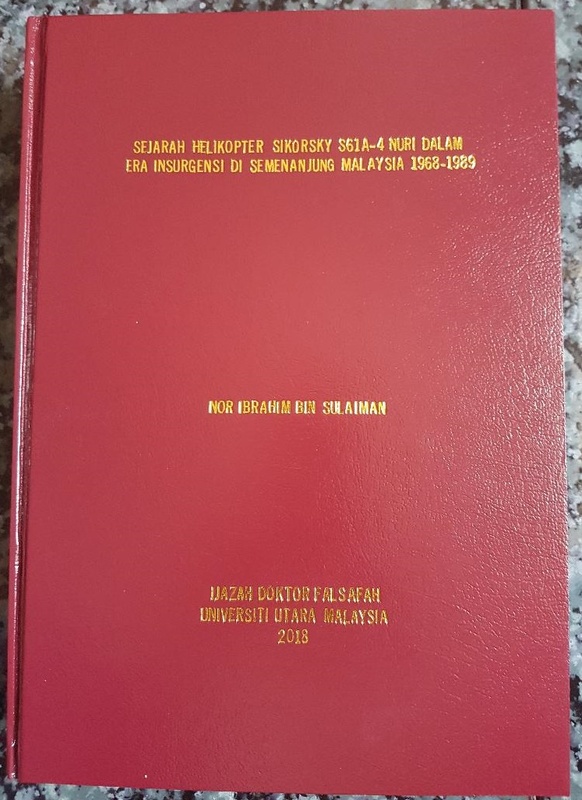 Dah le itu, dia tak dapat baca apa kerenah Tunku semasa rundingan dengan Chin Peng nanti. Jadi...ding-dong le telegram di antara dia dengan Lennox-Boyd, S. of S. Memanglah gomen Eden dah bersetuju bahawa Malaya tidak perlu menunggu tamatnya darurat untuk mengecapi kemerdekaan. Tapi perubahan dasar ini masih tidak diumumkan secara rasmi. Depa bersetuju MacGillivray mengumumkan dasar ini semasa persidangan Legislative Assembly pada 30 Nov 1955. Tapi apakah ayat-ayat yang perlu diucapkan oleh MacGillivray itu nanti? "Although the Emergency drags on, it is already clear that the communists have failed in their attempt to overthrow the Federation Government by force; and the Government does not propose to let them destroy it by subversion. Today, both here and in the united Kingdom, it is our common aim and interest to bring the shooting war to an end as quickly as is possible without prejudice to the future of the Federation as a free, democratic and self-governing country. It was with this in mind, nearly three months ago, the Federation Government, with the full agreement of Her Majesty's Government in the United Kingdom, declared an amnesty on generous terms. I therefore want now to make it quite clear that, even should the Malayan Communist Party obstinately persist in spurning this opportunity to prove their alleged desire to see peace return once more to the Federation, and should the shooting war consequently continue, it does not lie within the power of the communists as a beaten enemy to impede the Federation's political progress. It is, of course, essential fully adequate arrangements for security against communist aggression and subversion; and Her Majesty's Government will continue to such help as that may require. But, with the two Governments cooperating in the maintenance of that essential safeguard, and the shooting war consequently held down to its present sort of level, Her Majesty's Government would see no reason to regards the continuance of the Emergency as an obstacle int eh Federations's advance towards self-government - and I have their authority for saying that it is their intention to enter the London talks next year on that understanding." Bagi menentukan MacGillivray tidak lari dari teks ini, dia menegaskan "I should be grateful if you would adhere to this form of words." Itu dalam bahasa diplomatik. Dalam bahasa orang macam saya yang kurang refined ni...hang jangan memandai nak ubah ayat-ayat itu. Baca seadanya. (CO 1030/31, Telegram from S. of S. to Sir D. MacGillivray, (Secret and Personal), No. 169, 25th November, 1955. 18.45 hrs.). "He should not expect any more liberal terms than those already offered. A more liberal offer would mean one of two things-either an admission on the part of the Government that we are beaten or an admission on the part of the Alliance that the Communists are fighting the right cause. The truth is that the terrorists are beaten, and there is no chance achieving their aims. The longer they go on fighting, the further away they will get from their goal and the more suffering they will cause to the people of the country and themselves. If the Communists do not accept the amnesty, then it is clear they are fighting against the people of the country and not fighting against imperialism as their propaganda claim." 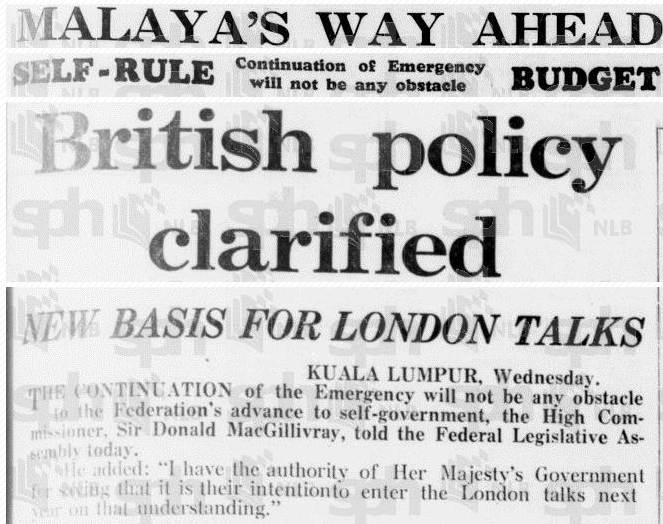 (The Straits Times, Tengku: Name The Day, 28 Nov 1955, hlm. 1). Selain itu, Tunku turut menegaskan bahawa PGK akan terus diburu dan dibedil jika mereka tidak menyerah diri. 30 Dis 1955...Bermulalah persidangan Legislative Assembly. Sepertimana yang diarahkan, menyentuh topik kemerdekaan, MacGillivray secara rasminya membaca teks Lennox-Boyd. Dengan rasminya, rakyat Malaya tak perlu lagi menunggu darurat berakhir untuk mencapai kemerdekaan! Menyentuh amnesty, MacGillavray menyatakan bahawa Tunku bersedia untuk bertemu dengan Chin Peng tetapi bukan untuk negotiation. Sebaliknya nak dengar apa yang ketua pengganas itu nak katakan. Mat Saleh ini juga menjelaskan "The greatest danger of all lies in the use of the well-known Communist technique of attempting to identify themselves with the the true nationalist movement for independence and to ride to power on the back of nationalist sentiment. Let us all be careful that we do not unwittingly lend them the vehicle which they wish to used to carry the along this road to the their ambitions." Semasa sesi soal jawab di dewan, Tunku telah diasak oleh ahli-ahli mengenai rundingan dengan Chin Peng. Beliau menjelaskan bahawa beliau sedia mendengar apa yang Chin Peng akan bangkitkan mengenai amnesty atau apa maksud terma yang lebih liberal. Namun demikian, beliau menegaskan "But my meeting will be neither negotiation nor peace talk. The principal object is to ask Chin Peng to lay down arms so that he and his men may be pardoned and take their place in society in the course of a year or two." 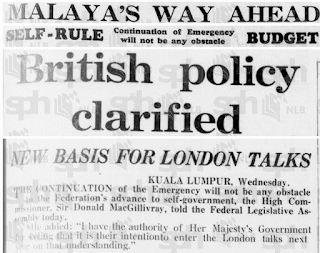 (The Straits Times, Tengku will outline plans for London Talks and Chin Peng, 1 Dis 1955, hlm. 4). Tunku turut ditanya sama ada Lee K.Y. akan turut diundang dalam rundingan itu nanti. Jawapan Tunku ialah "No". Pada 3 Nov, Tunku sekali lagi menegaskan objektif kesediannya bertemu dengan Chin Peng semasa sesi debat di dewan. Beliau menjelaskan pertemuan itu nanti hanyalah untuk menjelaskan terma amnesty dan mendengar pandangan Chin Peng. Jika pertemuan itu gagal, beliau akan merujuk kepada UMNO untuk tindakan selanjutnya. Beliau turut menegaskan "We will not negotiate. If we did so, it would amount to an admission of defeat on the part of the Government and the Alliance Party. It would mean that the militant Communists were right and that their atrocities have been committed in the cause of right and justice. We are not prepared to admit that." (The Straits Times, If Chin Peng turns amnesty down, 4 Nov 1955, hlm. 13). Cukup le buat hari ini. Bersambung...InsyaAllah.